I discovered I was pregnant with Natalie on Thanksgiving Day 2000. When the test I pulled out on a whim displayed two bright pink lines immediately, I went numb with shock. I hadn't been feeling well for weeks, but I had chalked it up to stress or maybe the flu. The girl who never wanted to be a mom was going to have a baby. It took a while for the adrenaline to stop pumping; about three months, I would guess, about the same time it took to get over the all-day sickness that always plagues my pregnancies. But once I got used to the mommy idea, trying it on for size and examining my new future in the mental three-way mirror, I was happy. You might even say I was excited. And it goes without saying, I was completely clueless. Corey and I were the last of our friends to get pregnant, the last to hop on the baby bandwagon. Thanks to their endorsements, I was already familiar with the popular parenting classes offered at our church, something about cultivating kids in the way of the Lord. But the class wasn't being offered again until after our baby would be born, and because I am a planner control freak, I went to a book store as soon as I was up to it and bought the book that summed up the curriculum. It was the only book I bought. Surely, I wouldn't need anything besides this one, I thought. But as I settled in to read that night, my stomach began to churn. I didn't have the experience to know if the authors' strict feeding schedules, cry-it-out sleeping methods or emphasis on parental authority would work. But I was appalled that they continually tied their formula back to God, as if Jesus himself had endorsed their ideas. "Do this, and your child will be a breeze, a child who will never rebel and who will love Jesus all their life," the book seemed to promise. "But if you dare to choose another path, God will punish you. Your home will dissolve into chaos, your marriage will disintegrate, your children will grow up unruly and hardhearted and you will only have yourself to blame." I know rotten theology when I see it. I started to do some research. And I got angry. Over Sunday dinner, I shared my newfound knowledge with my Dad, the senior pastor of the church we attended at the time. He was also gravely concerned. The church dropped the class and stopped endorsing the curriculum. I threw the book in the trash, confident that its foundation was so flawed, it had little to offer me. But that left me without a plan. What I wouldn't give to go back in time and hand myself a copy of Spirit-Led Parenting. Written by my dear friend Megan Tietz and her dear friend Laura Oyer, it is heaped with the kind of wisdom that would have soothed my soul and reassured me that the best thing I can do to parent my new baby is seek Jesus. As it so happened, Natalie was born in late July, and I feel so deeply in love, the very axis of my soul shifted. I jokingly say I experience postpartum euphoria, instead of postpartum depression, and it was never more true than it was that first time. Suddenly, things I never considered before became realities in my life. Breastfeeding on demand? Check. Co-sleeping? Check. Scheduling my life around this tiny infant instead of the other way around? Check. Maybe most amazingly, I didn't care if the experts said I was ruining my daughter. I could feel in my soul that what I was doing was the right thing for me, for us. And that is the message of Spirit-Led Parenting. It's true. Babies are individuals, unique in design and breathtaking in potential. Why do we expect them to operate like little machines? I have found so much wisdom in just getting to know my children and then reacting according to who God made them to be. Yes, this means my life the last 10 years has surprised me. I co-slept with all my children when they were infants; I still co-sleep with Kieran half the night. Our kids all breastfed well past one year. I never fed them traditional baby food. (Natalie wouldn't eat it, and so I went down the route of baby-led weaning before they had a word for it.) I rocked them, nursed them, sang them to sleep. I still sit in Teyla and Kieran's room while they nod off, because they don't like being alone. Does that mean I have discovered The Right Way to Parent? Hardly. What works for you may be completely different than what works for me. And that's OK. That's the point. But I do know my life today is radically marked by experientially knowledge of God's grace. It's been the best surprise. Parenting has humbled me, emboldened me, taught me selfless love. So much wisdom. I cannot recommend this book enough. It's not a parenting manual; it's a journal of humor and comfort, an encouragement that you can parent your children just as they are meant to be parented because you have the Holy Spirit. And in the end, that is enough. 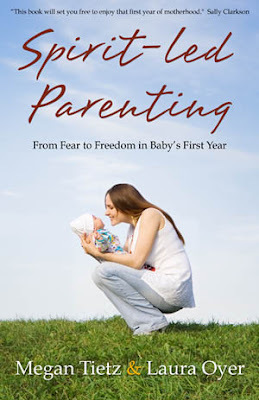 I am so excited to be able to give away a copy of Spirit-Led Parenting: From Fear to Freedom in Baby's First Year. Just leave me a comment here by next Friday, April 20 - and don't forget to leave me a way to contact you in case you win! Update: WE HAVE A WINNER! Kelly from View Along the Way. And get this: She had her second baby between the time she entered and I picked a winner. Glad to see she'll be able to put it to immediate use. Congratulations Kelly! To read more about Spirt Led Parenting and for more chances to win a copy of the book, check out these other stops on the blog tour. I think reading this book would be a blessing in my life. I have struggled the past few week after giving birth to a beautiful baby girl. I feel guilty for splitting my attention between her and my 13 1/2 month old son, not completing barely any of the items on my to-do list, not having a smoother transition since her arrival, needing to go back to work in a few weeks, etc., etc., etc. I know I need to slow down, enjoy the small things, change my perspective, and let go of feeling the need to be in control. I think this book would help me to do this. I have been a mom for 4 years now, and still every day I learn a better way to parent. I would love to win this book and pass it on to other new moms. Oh, I would love to win a copy of this for my good friend expecting her first! This book sounds great! One of my friends with young children loves Babywise and shares how much she loves it with other new moms. She probably things I'm crazy for not jumping on that bandwagon and thinks that's why my 14 month old daughter just started sleeping throught the night. I agree with Megan and Laura, each child is different and I have a happy healthy baby! Sounds like an awesome book. Thank you for the chance to win. I would love to win a copy!!! Sounds like a fabulous book! I am currently pregnant with our second baby and reveled in the first year of my firstborn's life by following my heart and not what people told me to do. He is a happy, healhty 2 yr old. I would love to be inspired by this book. My first baby is due at the end of June and I would love this book! Before my daughter was born last June, I read those books that introduces fear and guilt into my earliest Mommy moments and even up to now. I’m still trying to shake the notes I had etched into my brain to prepare for her arrival as I follow the Holy Spirits guidance in whats best concerning the daughter He has given us, the sweet girl who after spending he first 5 days in NICU now never wants to leave her Mommys side. I cherish these days while they last, every day she wakes p looking a little older, a little more life etched onto her sweet face and I know she wont always cling to me so, but I hope I am always, always clinging to Gods direction in being her Mommy….I need to read this book to help strengthen my resolve that I am doing whats best for my daughter, that Im not ruining her sleep habits by being there for her and building her trust! I really wish I would have had the opportunity to read a book like this before my daughter was born. She's almost 10 months now, and while I certainly haven't figured it all out, after reading different parenting methods and feeling like a complete and total failure of them all, my husband and I finally decided to chunk all those books out the window and do what worked for us. Seems like this book would've provided some much needed encourgement. My best friend is expecting her first in October and I would love to give this book to her. I would love this book! My baby boy is now 20 weeks and, so far, our alternative approach to parenting (home birth, cloth nappies, breastfeeding on demand and hopefully baby-led weaning) continues to welcome much criticism and 'advice'. I knew there must be other Christian parents on the same page but couldn't find any books on parenting a baby. This sounds like what I've been searching for! I was one who started off parenting under the mindset you described above, the very law-driven, "you must parent this way, unswervingly, or your children will be rebellious and reject the Lord because you failed". It was soul-crushing. My son was strong-willed and stubborn and did NOT fit into the guaranteed mold that the book I had read (wondering if it's the same one your church was teaching from?) had assured me he would, and I found myself drowning in despair that I was already ruining him, and he was not even a year old yet. I stumbled upon a book called "Give Them Grace: Dazzling Your Kids with the Love of Jesus" by Elyse Fitzpartrick and Jessica Thompson, and while that book is more angled towards parenting older children with whom you can communicate the Gospel and walk through the truth, it changed my life. I could NOT believe how much freedom I found from being reminded that my child's spiritual destiny was in God's hands, not mine, and that He was infinitely more capable and even more concerned for their spiritual health that I am. That all that's required of me in the end is that I love my children, I communicate the truth of the Gospel to them, and I seek the Lord for wisdom in our daily choices and challenges. But as I said, this book is geared more towards the parenting of older children rather than babies, so when I heard about "Spirit-Led Parenting", I knew I had to get my hands on it! I want so much to communicate this freedom to other new parents I know. My second baby is 6 weeks old now and I am excited to face this first year with a fresh outlook, to enjoy our children and continue to trust the Lord to show us who they are as individuals and how my husband and I can best parent *them*, since they are the children God gave us, exactly as they are! I would love a copy of this book as I continue to explore this! Thank you for the offer!! What lovely excerpts. I am so glad this book has been written! I would love to read this!! I have four little ones, and several pregnant friends - expecting their first babies. I'd love to read this! We just brought home our second from the hospital, she's 11 days old! Perfect timing! I'm dying to read this! My second is due any day now! I'd love to have a copy to give to a new mama I know, who will be facing criticism for following her God-given instincts. This book sounds great. In the end, I think a good nyc mom blog can be a great resource through all of the stages of a child's life, and is often more relatable than some parenting books. My favorites, like Young Urban Moms, have a ton useful tips that only come with experience. I get great tips, advice, stories, and ideas from moms that are really easy to relate to and really funny. You should take a look. I have two right now that are 18 months a part with the youngest at 6 months. I could use this book right now. I really hope that I can get one. Thanks for the opportunity. I am 30 years old and a first-time, expectant mother. I am extremely excited but also anxious at the thought of becoming a mother. On one hand, I have wanted to be a mother for pretty much my entire life, but I am also already letting myself succumb to fears and doubts (and I’m only 6 weeks along!). I think reading this book would be an incredible blessing to me, to help me stay focused on the Holy Spirits’s guidance, and not to let my uncertainty keep me from being the mother God has created me to be. I would love to win a copy of this book! I think it would be extremely encouraging to me... I have two daughters, 18 months and 3 and half years old. Thank you so much for the opportunity! Baby #2 is coming soon and I need this book. All my other "baby rule books" have been hidden by my husband because they made me go crazy last time. Focusing less on Rules and more of Freedom this time around. I'm about to become a mom (in three weeks! ahhh!!) and I would LOVE to have a copy of this book. I have two babies already (1 and 2) and planning for a third. Just reading the blurb of this book has helped me chill the heck out. I would love to win it! I'm expecting my first child & would love to read this! I have been avoiding most baby books because I'm worried that they'll be all about rules, but this one sounds fantastic!! I would love to read this! It sounds amazing and something I will definitely have to get for our church library. Thanks for the opportunity to win! I'm not sure I have time to read this book, but I like the premise! I did the no baby food thing with my first and then discovered that my second would not eat my home ground food. about 2months he would only eat the most puréed baby food - and this was after nursing exclusively until 8 months. I just had to go with it because he needed to eat something! I can already see differences in my twins and I hope I can respect them each enough to let them be different! I would love to win this book. I treasure my daughter every day, but it's a struggle some times.